The U.S. Transhumanist Party / Transhuman Party has achieved its first legislative victory. We previously issued an alert about Nevada Assembly Bill 226 (AB226), which originally was written only to prohibit compulsory microchip implants, but whose sponsor, Assemblyman Richard “Skip” Daly, proposed an amendment to also prohibit all voluntary programs for the implantation of a microchip. This concerned us greatly, as it would have essentially prohibited both medical implants with electronic components, as well as implants pursued for reasons of esthetics, self-expression, and functional improvement. Although we learned of the proposed amendment only two days before the March 15, 2019, Work Session at the Assembly Judiciary Committee, the dedicated grassroots activists among our membership sprang into action. USTP activists quickly published an article, circulated tens of posts via social media, informed prominent transhumanists via e-mail, submitted comments on the Nevada Legislature and to the Assembly Judiciary Committee, and reached out to Legislators. 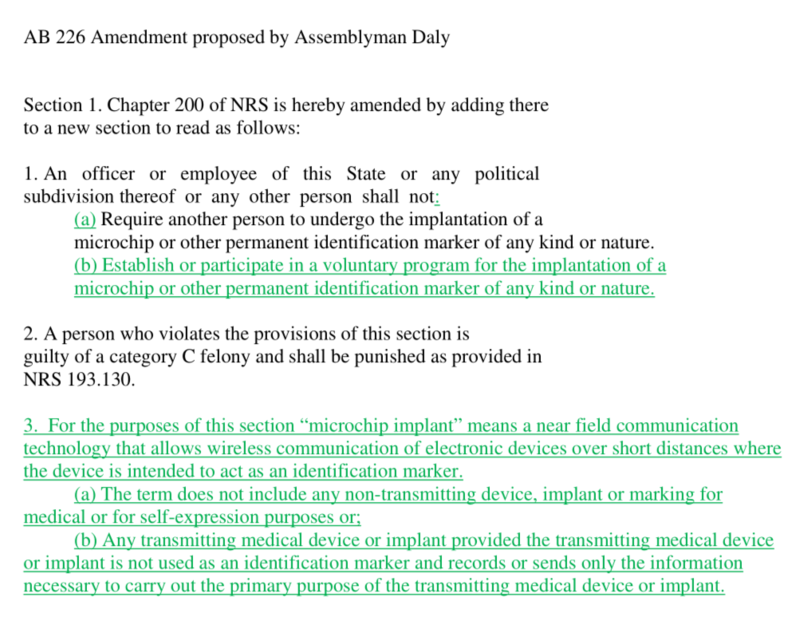 We greatly appreciate that Assemblyman Richard “Skip” Daly took our concerns into account and proposed Subsection 3 within his amendment (below), which defines “microchip implant” in quite a narrow manner, addressing his concerns about potential future institutional pressure to use implanted identification markers, while exempting from the bill’s scope any medical devices, artistic implants, or implants pursued for reasons of personal expression. This amendment was incorporated into AB226 at the Assembly Judiciary Committee Work Session on March 15, 2019. The U.S. Transhumanist Party / Transhuman Party believes that AB226, as amended, is no longer a cause for significant concern. While we are not thrilled about any restrictions on voluntary, peaceful activity, we believe that medical innovators, patients, artists, biohackers, grinders, cyborgs, fitness enthusiasts, and many other users of functional implantable technologies will not be at risk from this bill. Thank you to the transhumanist community for mobilizing so effectively to achieve this victory! This, friends, is why we need a Transhumanist Party. Join us for free. It is also noteworthy that AB226 has not yet been enacted into law. It will still need to come before a vote of the full Assembly Floor Session, after which the bill would move to the Senate, where a public hearing and a Senate Judiciary Committee work session would need to be held before a full Senate vote. The public hearing in the Senate would be the opportunity of those with remaining concerns to testify on AB226. Furthermore, the Nevada Legislature website allows members of the public to submit their opinions about specific bills, and it is also possible to contact Assemblyman Richard “Skip” Daly, the sponsor of AB226, as well as the Assembly Judiciary Committee and the Senate Judiciary Committee to express one’s views. AB226 can also be monitored on NELIS, the Nevada Legislature’s online informational system. To respond to some of the critical comments made by R. Nicholas Starr in his dissenting article, it is important to recognize that the inclusion of Subsection 3 in AB226 is at least an incremental victory, because it turned an essentially absolute ban on all implants (which would have crippled medical progress) into a more limited ban on implantation of NFC devices used as identification markers. It is still possible that a technical reading of the text – particularly of the phrase “intended to act as an identification marker” – in fact creates a safe harbor for many NFC implants that are not intended for identification purposes. For instance, if Person X were to have a functional NFC implant that enabled him to open car doors but that did not specifically identify him as Person X, a strong case could be made that participating in a voluntary program to receive this implant would not be prohibited if AB226 were to be enacted. The NFC tag may have a number assigned to it, but if the number is not also assigned to an individual, this tag may not be an “identification marker”. For instance, a person could hypothetically have two or more tags with distinct numbers that have a similar or identical intended function. If neither of the unique tag numbers would necessarily be associated with that person as an individual, then one could make the argument that the number of the object (the tag) is not a number that has any relevance to the identity of the person in whom the tag is implanted. The USTP does acknowledge, however, that services which specifically market themselves as providing identity-related security and verification would find the amended version of AB226 problematic, and representatives of such services are encouraged to voice their views, including by using the Legislative contact information and opinion-sharing functionality linked herein.